Come and experience a splash of paradise. Walk on the white sands of Crescent Beach, go shelling, find sand dollars, watch the dolphins or just lounge by the pool. 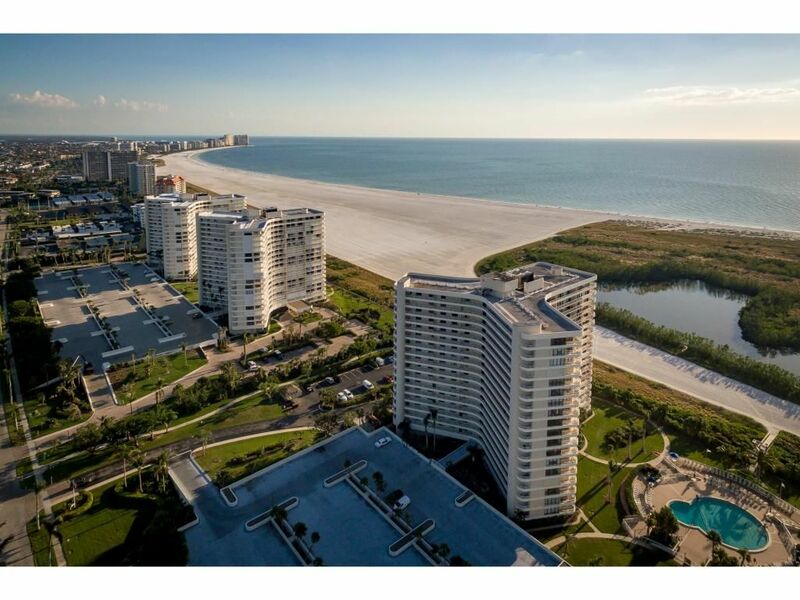 It's all possible when you book your stay at this 2 bedroom, 2 bath beachfront condo located on sunny Marco Island. Our home features new furnishings, new carpet, upgraded kitchen, flat screen smart HD TV's,free wi-fi in the unit and more! Relax on the beach or snooze on the 32 foot lanai on a sunny afternoon. Our unit is complete with full kitchen and snack bar, all appliances, dishes, and utensils. We supply plenty of towels, beach chairs, umbrella, and a beach cart. There is a spacious master suite with a king sized bed over looking the Gulf of Mexico. The 2nd bedroom includes 2 FULL SIZE beds, HD flat screen TV. . Each bedroom has its own bathroom. The living room overlooks the beach and can comfortably seat 4 - 6 persons. This condo has been tastefully decorated and has all the comforts of home. Washer and dryer are accessible on the same floor. Please contact me directly for the best and accurate quote. After coming down for 9 years we really got used to getting out of the cold Minnesota winters for a couple of weeks in January. We found it was a great way to break up the long winters. Now not only are we fortunate enough to enjoy our own place on the beach of Marco, but we get to share the experience with others. It's funny, our friends always ask us what we have planned for our trip to Marco and we just laugh and say 'nothing' For us that's the best part of coming to Marco Island, we don't have to plan. It's a great place to simply come and relax and take each day one at at a time. Lots of beach time, pool time, a round of golf or two, and a beverage of your choice at sunset! Not to mention the boating , fishing and shelling that is part of daily life on Marco Island. Our 2 girls have been coming to Marco since they were born. They love the beach, especially going to the beach early in the morning to look for sand dollars. Oh did I mention the pool, they love the pool too. Marco Island does have plenty to do. Lots of great restaurants, fresh seafood, boat and jet ski rentals, golf, fishing, biking, parasailing and much more. So whether your looking to come and veg out and recharge your batteries or you want to be more active, there really is something for everyone here. Marco Island is the perfect vacation destination. We love it and I know you will too!! Wonderful place with an amazing view! The 2 beds in second bedroom were not comfortable and the air conditioning is VERY loud but that’s our ONLY COMPLAINT. Everything including the grounds were clean and well groomed. Many rules and mostly over 50 people while we were there. A week before you arrived we had the AC system in the unit replaced. After reading your review I called the installer to check on the noise issue. It seems they did not replace the sound baffle in the unit. We were down about a week ago . Now the the sound baffle is in we found the AC noise level to be fine now. As for the beds, I am surprised you found the beds uncomfortable. We have had many positive comments regarding the guest room beds being comfortable and complementing us on having full size beds, not twin size beds in the guest bedroom as most other condo units in our complex have. Sorry you found them not cozy for you. Delightful and lovely condo in a great location. Secure grounds. Many restaurants, shops and entertainment close by. Condo is a home away from home. Comfortable,clean and nicely decorated. Wide expanse of beach, but about a ten minute walk to oceanfront. Craig the owner is great to work with. Fast to respond to questions. We went to relax and met our goal. It was great. Will be back! Thank you Ann, so glad you enjoyed your stay with us. Love the heading of your review!! We stayed here mid-May with 2 teenage daughters and had a fabulous time! Highly recommend and will be returning. Craig and Maria are easy to work with and give good instructions regarding the condo facilities rules etc and answer any questions you may have before going. First, the condo is a nice size and very clean and comfortable. The beds are very comfortable, we slept better than at home! My daughter fell asleep on the couch also as it was so comfortable. It is supplied with many conveniences. from the blowdryers to boogie boards, beach chairs, umbrella etc. They have thought of everything. The lanai is a great size and has a beautiful view. We sat out there daily. My older daughter used the exercise room without complaint. We used the laundry facilities-very clean (follow instructions & the dryer takes more than one cycle). We loved the pool (warm). The whole building/grounds is very clean and quiet during our stay. The kitchen is stocked with nice dishes, pans, coffee maker, utensils, blender, ice maker..everything you need. Also, there are some basics there for use like salt/pepper, dish soap, dishwasher detergent, TP etc, but we were unsure so had shopped prior to our arrival and stocked up on those things and left behind the unused. There are misc. supplies like this that I am sure others have left behind. Craig gave us great suggestions on dining and entertainment while we visited. There are restaurants in walking distance. There is a car service available on the island (ACarr) that is complimentary from South Sea's to certain restaurants. We used them one evening and they were timely, friendly and convenient! Also used Uber one night because we forgot about this service. Parking can be challenging for some establishments. I do suggest walking to Sami's while there. Inexpensive, great food, great customer service. We arrived from the Fort Myers airport. Easy drive there. We stopped at WalMart Supercenter in Naples for groceries, it is right on the way, easy to find. On the Island there is a Publix and Winn Dixie we used with liquor stores. Winn Dixie was clean and less expensive. Lots of fun shops, restaurants, parks and things to do. I recommend Florida Adventures for an awesome Dolphin sightseeing boat ride. The condo is right on the beach but it is about a 10 min walk to the water (BIG beach). The beach is clean with lots of shells. Loved our beach walks. Lots of wildlife to see! Even dolphins frequently. So glad you enjoyed your first time in Marco. Hope to see you again soon! The stay was Wonderful!! Beautiful Clean and Picture Perfect Views on the Beach Loved every moment!! The Owner is Amazing to engage with Always. We have stayed in CasaDelSol 3 times wouldn’t stay anywhere ELSE. Can’t wait for next Year’s Trip to the Beautiful Marco Island 🌴. Wonderful spot on Tigertail Beach! Condo- perfect size for our family of 4, 2 adults, 2 teenagers. Bedrooms were good sized, beds comfortable, and rooms are a nice distance away from each other. Beautiful view! Netflix and WiFi works perfectly. Location- Beachfront, but there is about a 3-5 minute walk across the sand to get to the ocean. Condo was supplied with nice Tommy Bahama backpack chairs and a cart. Beach was full of shells during our stay, but plenty of sand to settle yourself in. Water was beautiful and a couple of dolphins made an appearance. If you take a right once you get to sand, there is a spot to rent kayaks. Or, get to the ocean and walk right as far as you can thru scenic small lagoons. Lots of people with sand dollars coming from that direction. As far as restaurants, there are maybe a couple within walking distance, but to get to most just call the ACar transportation service, it’s usually free (they will tell you which restaurants they have an agreement with), just tip the driver. We had a wonderful time! Just a note, the office only takes cash or check for the registration fee. We so enjoyed our 1 month stay due to the Condo unit's cleanliness and amenities and best of all the location with it's beach view! Rates are subject to change and all pricing must be confirmed with the owner. 25.00 condo association registration fee due upon arrival. This fee is imposed by the condo association, not the owner. The weekly rate is the same whether guests stay 6 or 7 nights Guests are required to register within 24 hours of arrival. Weekly rentals are from Saturday to Saturday. Six night accommodations may be made depending on availability. The rate does not change for a 6 night stay. You pay the full weekly rate. The months of February and March are not available for weekly bookings Contact owner for more information. Monthly bookings can be split into 2 payments with the final payment due 90 days prior to arrival date. Weekly bookings require payment in full at the time you book it.